Join me tonight, Thursday, February 21st, for a live and interactive FutureofEducation.com conversation with Maurice Gibbons on self-directed learning. Gibbons is the author of The Self-Directed Learning Handbook, was a founding member of Challenge Education Associates that produced The Self-Directed Professional program for teachers, he was the founder and director of Personal Power Press which produced a dozen books on SDL, and he was a founding member of World Citizens for a Universal Curriculum, a global education project designed to empower students to create a sustainable world. Mightybell: A Mightybell space with interview resources and conversation is at https://mightybell.com/spaces/23960. (From his website) Maurice Gibbons is a Canadian who grew up on the west coast, completed his BA at the University of British Columbia, his MA in English at the University of Washington, and his doctorate at Harvard where he was on the editorial board of the Harvard Educational Review. He taught in elementary and secondary schools before teaching at the University of British Columbia and at Simon Fraser University, from which he is now an emeritus professor. A specialist in the creation of innovative approaches to instruction, the programs he has designed emphasize self-direction, challenge and excellence. 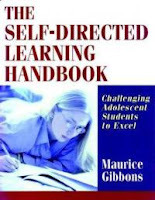 In 2007, Gibbon’s was awarded the Malcolm Knowles Memorial Self Directed Learning Award at the 21st annual International Self Directed Learning Symposium. Gibbons publishes fiction and poetry and is an exhibiting sculptor. He used SDL methods to learn to carve wood and has exhibited his work in Vancouver, San Francisco, Sydney and New York -- website coming soon. Gibbons was arrested at Claoquot Sound in civil disobedience against the clearcutting of old-growth timber in the Pacific Northwest. He is married and lives in West Vancouver, British Columbia, where he carves, writes and consults. Gibbons is well known for the provocative speeches and hands-on workshops he presents worldwide.